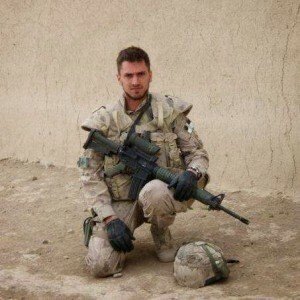 After a close brush with death in Afghanistan, former Laval resident Cpl. Franck Dupéré has chosen to channel his life journey right into a career as a motivational speaker. His experience as a soldier in Afghanistan has led him to speak to high school students, veterans and sports teams about his drive to accept what life has dealt him and grow from it. Cpl. Dupéré joined the Canadian Forces when he was 16-years-old. He signed up with Laval’s 4th Battalion, Royal 22nd Regiment. After completing his basic training course he qualified to operate machine guns and communication devices. With a tour in ex-Yugoslavia in 2001 under his belt, he accepted a mission to Afghanistan in 2008. In 2011, he experienced the nightmare that civilians can only imagine. A suicide bomber strapped with over 150 pounds of explosives detonated the device within a few metres of Cpl. Dupéré. Thrown like a puppet by the blast, he was certain he was doomed when he looked down and saw the slice in his throat. Fortunately for him, he was right next to an experienced medic who took control of the situation and performed a tracheostomy right there on the front lines—with no anesthetic. The emergency intervention saved Cpl. Dupéré’s life. Days later, Cpl. Dupéré woke up in a trauma treatment hospital in Germany. The doctor there explained his injuries to him and what had happened. After more than 18 surgeries with another still to go, Cpl. Dupéré has courageously accepted the path that life has given him. He now shares his inspirational attitude and generous spirit by giving motivational speeches to anyone who needs him. Last year Cpl. Dupéré participated in CBC’s March to the Top, a compelling and emotional documentary highlighting the challenges 12 wounded Canadian vets faced as they struggled to the 20,305 ft. high summit of Island Peak, a mountain near Everest in the Himalayas. He is also honorary chairman of the Mingo-McEwen fund; a West Island based foundation that has raised more than $750,000 during the past 14 years for local charities. You can follow Cpl. Franck Dupéré on Facebook or contact him at  512-8815. Decorated Corporal Franck Dupéré helps others with his motivational speeches.